There have been sightings of coyotes in the areas around Syd Kronenthal Park, Culver Crest and Lindberg Park neighborhoods. Attached you will find an alert/informational flyer with safety suggestions for our residents. 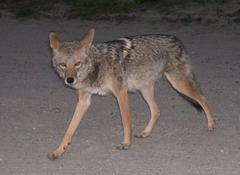 Please report wildlife sightings and issues to 310) 253-6143 or animal.services@culvercity.org. As always, call 911 in case of an emergency.